Stylish, large table base with a four legged chrome foot design and a black powder coated steel column. Suitable for use with table tops up to 1000mm round or square. Ultra stylish and practical in design. 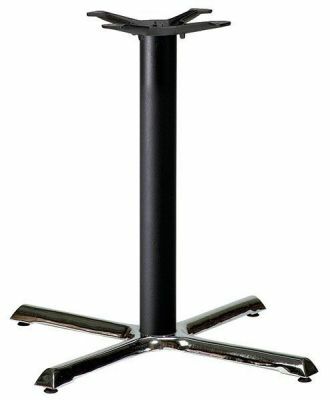 This table base compromises a sleek black cast iron column, and wide spread polished chrome cross obase. Complete with small rubber feet for grip. Expect a fast delivery from stock.